Founded in 2011 by four former Stanford University college students, SoFi started out by focusing on refinancing student loans. But now it’s one of the largest online fintech lenders in the United States. The San Francisco-based digital financial company originally utilized an alumnus-funded lending model that connected students and recent graduates with alumni and investors. With this model, the investors received financial returns and borrowers obtained rates lower than the federal government offered. Fast forward to 2018, and SoFi is a powerhouse in several financial sectors, including student loans, personal loans and, more recently, mortgages. The company has even started to offer wealth management and life insurance. Because SoFi is an entirely online, virtual platform, it doesn’t have as many underwriting costs as traditional brick-and-mortar lenders. That means the company can offer lower interest rates and faster turnaround times for funding. It has a different perspective on how applicants qualify for loans. Instead of looking solely at credit score and income, the lender also considers other factors like education and career outlook. SoFi is an innovator in the lending world, not only for their total online approach, but also for its products and services. Those who take out a loan with this lender gain entrance into a club that offers its members special benefits like career support, networking happy hours and unemployment protection. One thing that makes it standout from other lenders is its unemployment protection. It allows members to suspend loan payments for up to three months initially and up to 12 months total over the life of the loan. Members must be eligible, apply for unemployment benefits and actively work with the SoFi Career Strategy group during their loan forbearance. It also holds industry-specific networking events and happy hours so that members and alumni can connect both professionally and personally. According to their website, a typical social event — like a dinner or happy hour — is led by a member of the community team, lasts two to three hours and includes hosted food and drinks, with swag included. This lender tends to target a specific type of borrower ­— those with excellent credit scores, high salaries and an education or career path that suggests financial stability. Individuals who don’t meet that criteria may not qualify for a loan. Different types of personal loans can be used for a variety of reasons from this lender. That includes consolidating expensive credit card debt, doing remodels or home improvement projects, paying for a wedding or other special event, taking a vacation or paying medical bills. SoFi personal loans offer low, fixed interest rates that can make monthly payments more affordable. If you have loans or credit cards that charge more than 10%, it may make sense to pay them off using a lower-rate loan to save money. Plus, paying down credit card debt can help increase your credit score. SoFi offers personal loans from $5,000 to $100,000 that you can use for any personal reason or expense. You choose either a 3-, 5- or 7-year repayment term that fits your financial needs. SoFi personal loans are unsecured, which means that you do not need to provide collateral to qualify for a loan. When you apply for a personal loan, watch out for fees and penalties. Some lenders charge an upfront origination fee to process your loan, more fees at closing and a prepayment penalty if you decide to pay off a loan early. But SoFi doesn’t charge any of these fees, making their personal loans more affordable for borrowers. You can get pre-qualified instantly for a SoFi personal loan with no fee or obligation. There’s just a soft inquiry on your credit, which never shows up in your credit history or affects your credit scores in any way. SoFi personal loan borrowers are called members, and they get access to unique benefits. In addition to customer support, seven days a week, SoFi offers members career counseling and financial advising. Members can also attend exclusive social events and dinners throughout the country. Plus, members receive unemployment protection that allows you to temporarily stop making loan payments if you lose your job. SoFi beats its competitors in a variety of areas. Along with extremely competitive interest rates, it offers membership perks that many other lenders simply don’t. But loans from this lender are less accessible to those with lower incomes or poor credit. If you can meet the criteria (you have excellent credit and financial stability), and you’re looking for perks in addition to a loan, this lender could be a good fit for you. 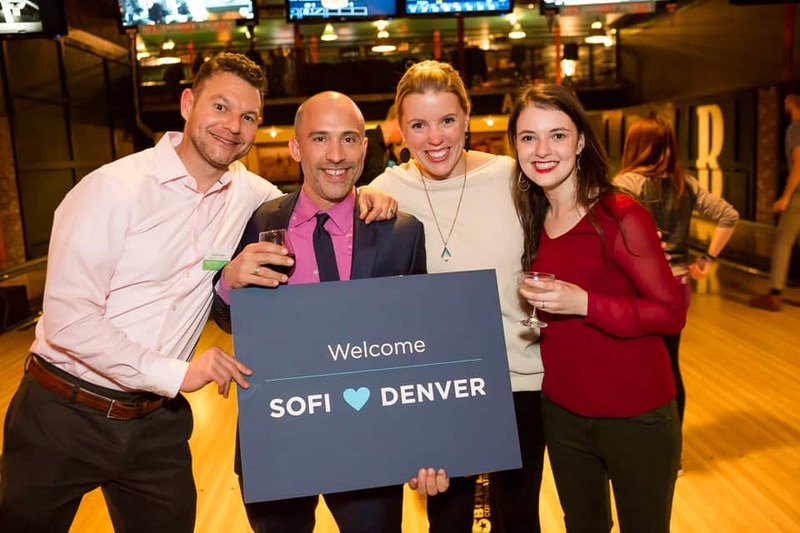 Applying at SoFi is straightforward and can be done on the lender’s website. You’ll start out by setting up an account and answering some basic information about your total debt, your education and your employment. The online approval is the first step before you complete a full application. Get a rate estimate. Fill out the online application and get pre-qualified. It will do a “soft pull” on your credit, provide an estimated interest rate and present payment options. Pick a loan option. Select a rate and payment term that fits your budget and apply through the website. Provide documentation and sign. Use the lender’s website to sign documents and submit the full application. If approved, the lender will wire funds to your account. With SoFi, you repay your personal loan by making fixed monthly payments plus interest. The APR range for SoFi is between 5.99% and 16.49%, very competitive compared to other personal loan offers. If you make SoFi loan payments electronically via ACH, you save money by getting a 0.25% discount on your interest rate, which is reflected in the rates listed above. You can also make payments using your bank’s online bill pay or send a paper check. And if you have a loan in good standing, you can change your payment date, if needed. SoFi offers a quick online process for rate quotes. If you’re approved, you choose the loan option that works best and complete your application with an electronic signature. After that, your funds are wired into your account — the entire process can take less than a week. Posser says that cash flow, which is income minus debts and living expenses, is one variable SoFi uses to evaluate potential borrowers. They want to know that you have enough disposable income to keep up with monthly personal loan payments. Loan eligibility also depends on other factors, such as a responsible financial history and your professional experience. You must be a U.S. citizen or permanent resident who is age 18 or older and live in one of SoFi’s eligible states. Personal loans from SoFi currently aren’t available to residents of Mississippi or Nevada. All rates, terms, and figures are subject to change by the lender without notice. For the most up-to-date information, visit the lender’s website directly.